The EPA chief is very wrong about Harvey. The human tragedy resulting from Hurricane Harvey is also an environmental crisis—and the Environmental Protection Agency, even as it has been disrupted and diminished by the Trump administration, is playing a crucial role in responding to the flooding that has created dramatic new perils for Texans. Unfortunately, the charlatan who heads the EPA, Scott Pruitt, is spinning discussions about that response to make them fit within the narrow confines of his climate-science denial. As America’s fourth-largest city was under water this week, and as reports mounted regarding environmental threats unleashed by the storms and the unprecedented flooding of industrial and refinery zones, Pruitt’s EPA went so far as to criticize media outlets and scientists who dared to suggest that there are explanations for the epic rainfall, storm surges, and flooding associated with Harvey to be found in climate science. Pruitt is actually claiming that attempts to explain why the crisis in Texas is so severe are “misplaced,” and to suggest that media outlets ask for these explanations for “opportunistic”—as opposed to journalistic—reasons. Pruitt is wrong. The discussion is not “misplaced.” It is timely, and necessary. Unfortunately, Pruitt is not a scientist. He is a career politician with close ties to the fossil-fuel industry—and to the climate-change-denial projects that have been developed by right-wing campaign donors and lobbyists to protect the profiteers. As the scandal-plagued attorney general of Oklahoma, Pruitt faced constant criticism for using his position not just to battle against the EPA but to battle against science itself. Pruitt has been especially aggressive on climate-change issues, working with Transportation Secretary Elaine Chao and others in the administration to reverse progress made during the presidency of Barack Obama. The new EPA head refuses to acknowledge the most basic conclusions of climate science and has recruited researchers to try to discredit scientific evidence he disagrees with. But Pruitt did not stop with that dubious “victory,” however. 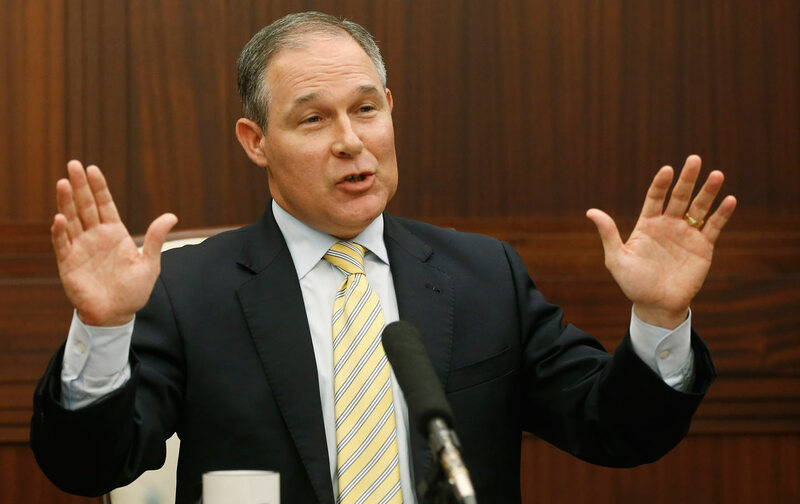 He has remained so ardently at odds with science that he has created a new EPA ethic that includes attacking scientists merely for speaking up on climate-change issues. That statement summed up the Orwellian turn the EPA has taken under the leadership of a politician who is more concerned about his ideological obsessions than threats to the planet. Scientists who discuss solid physics and universally accepted concepts with regard to climate change are not politicizing the agonizing moment in which Texans find themselves. They are offering explanations, and useful cues for how to respond to an era of “super storms.” And they have been doing so in a reasoned, nuanced manner that does not casually blame hurricanes and tropical storms on climate change but that instead points to evidence that hurricanes and tropical storms are becoming more severe because of global warming. The scientists are dealing in facts, and logic. They are not “politicizing” the debate. The debate has been politicized by corporate interests that seek to deny reality—and by an EPA administrator who is so beholden to those interests that he is turning an essential federal agency into an increasingly absurd and dangerous reflection of his jaundiced worldview.